An action-adventure in which a group of air crash survivors - cast-offs from society who will never be missed - are stranded on the Mongolian desert with no hope of rescue. $5.019 million on 2604 screens. Around Christmas, I browsed the movie listings to decide if I wanted to see something new. I noticed a flick called Flight of the Phoenix on some screens, but I had absolutely no idea what film this was. I’d heard nothing about it - I couldn’t recall seeing a single trailer or TV ad and didn’t even notice any reviews! Apparently I’m not the only one for whom Phoenix slipped under the radar. Despite a wide release, the movie earned a mere $20 million at the box office and sunk like a stone. With a relatively low budget of $45 million, that wasn’t an atrocious number, but it must have been a disappointment. The movie itself didn’t deserve to vanish without a trace, but I can’t claim that it merited a much broader audience. The action starts in Tangsang Basin, Mongolia, where the Amacore Corporation runs a test well in an attempt to locate a new source of oil. Spearheaded by engineer Kelly Johnson (Miranda Otto), this search fails, so Amacore shuts down the operation. Pilots Frank Towns (Dennis Quaid) and AJ (Tyrese) fly in to extricate Kelly and the crew. Mysterious nomad Elliott (Giovanni Ribisi) also comes along for the ride. As they depart, they encounter a massive sandstorm. Despite warnings from Elliott, Frank decides to attempt to fly through it. This fails, and the plane crash-lands in the middle of the Gobi Desert. With their radio down, they have no way to contact the outside world. They need to figure out how to survive while they wait for help. However, after a while, it doesn’t look like assistance will come in time, as their water will run out quickly. Elliott comes up with an idea: he feels they can build a new plane from the remnants of the old one. Frank initially resists this, but he eventually accedes to the desires of the others. 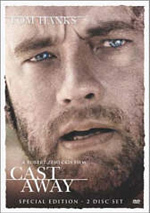 The rest of the film follows their attempts to construct a new vessel and survive. A remake of a 1965 flick with James Stewart, Phoenix falls firmly into the category of “decent but definitely could have been better”. Some of the better aspects of the flick relate to its sporadic action sequences. The initial plane crash works really well. Aided by a phenomenal soundtrack, this scene starts the movie off with a bang and becomes quite harrowing. Later bits that also go the action route manage to create some excitement and drama. I also like the basic story of Phoenix. No, the concept of folks stranded in the middle of nowhere isn’t original, but it presents a lot of potential. The twist in which they try to build the new plane adds some spark and gives the movie a nice curve. Where the flick falters connects to the execution of the story. Director John Moore has a flair for the action pieces but seems less able to make the rest of it work. Granted, I suspect a lot of the film’s problems stem from the script. There’s simply not much depth to it, as the characters never rise above the level of basic stereotypes. They’re consistently one-dimensional and lack much to make them memorable. Actually, one minor surprise comes from Ribisi’s Elliott. I’ve been down on the actor for quite some time, as he usually infuses his characters with quirky mannerisms and no real truth or personality. Some of that comes through here, but he manages to make Elliott more intriguing and less annoying than usual. He creates the most interesting character and manages not to irritate me, which is no mean feat given my feelings toward him. Otherwise, the characters fail to become very involving, and the story stays on the surface as well. I think there’s a good psychological drama possible from this material, but Phoenix almost totally ignores that side of things. We see some intriguing threads related to survival versus the retention of one’s humanity, but these get shunted to the side in favor of musical montages and various superficial elements. Flight of the Phoenix stands as a flick that will likely entertain fans of the action genre, but it won’t be able to expand past those boundaries. Some movies can overcome become appealing to a wider audience, but I don’t see that for Phoenix. It’s got enough to keep the interest of action fans but never threatens to turn into something more engaging. 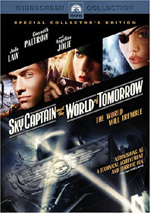 Flight of the Phoenix appears in an aspect ratio of approximately 2.35:1 on this single-sided, double-layered DVD; the image has been enhanced for 16X9 televisions. 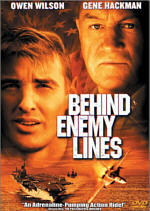 While the movie always looked decent to good, it lacked the clarity to make it outstanding. One of the erratic elements related to sharpness. Much of the flick presented fairly crisp and detailed images. However, occasional shots looked moderately soft and ill-defined, and these instances were more prominent than usual. Some of that stemmed from the mild edge enhancement I noticed through much of the movie. No issues with jagged edges or shimmering occurred, however, and print flaws seemed to be totally absent. I wouldn’t expect a movie set in the desert to feature a varied palette, and Phoenix indeed stayed with restrained tones. Sandy hues dominated, as only sporadic examples of other colors popped up in the flick. The hues appeared well-developed and concise for what they were. In addition, blacks looked deep and firm, but low-light shots caused problems. Some of that occurred due to surprisingly dense day-for-night scenes. These consistently appeared way too dark and never worked realistically. Other shadows also lacked the definition I’d expect. Enough about the transfer succeeded to earn this one a “B”, but it had room for improvement. On the other hand, the audio of Flight of the Phoenix fared very well. The DVD included both Dolby Digital 5.1 and DTS 5.1 mixes. I liked both but favored the DTS track. I’ll discuss it first and then relate why I thought it worked better than the Dolby version. For the DTS mix, the soundfield was very broad and involving. This occurred all throughout the film, though the louder sequences came across the best. Unsurprisingly, the early sandstorm/crash scene impressed. It spread the storm actively all around the spectrum, and the various aspects of the plane’s problems also zoomed about us. Quieter moments worked well too, as the track brought out the nuances of the desert in a vivid manner. The high quality of the soundfield spread to the music as well. Phoenix used a fair amount of non-score elements like the Johnny Cash song that opened the movie. These displayed better than usual stereo separation and delineation, and they really impressed me. Across the board, the DTS track displayed good localization of material and blended them all together impressively. In addition, the quality of the audio was top-notch. Speech always came across as natural and distinctive. No issues with intelligibility or edginess manifested themselves. The music was vibrant and dynamic. Even with the variety of sources, the songs sounded vivid, and the score also demonstrated great clarity and definition. Effects were lively and true. No distortion marred them, and they sounded clean and smooth. Bass response knocked one out of the part with deep, concise tones that nicely accentuated the action. I was a little reluctant to give this one an “A” because it lacked the ambition I usually require to give a soundtrack that high a mark, but it sounded so good and often worked all the speakers so well that I thought it deserved that grade. What caused me to go to an “A-“ for the Dolby Digital track? It simply lacked the breadth and force of the DTS mix. The two soundfields were usually very similar, but integration seemed stronger for the DTS edition. In addition, it demonstrated more powerful bass response and a greater sense of definition to its elements. If you opt for the Dolby mix, you’ll still be happy, but I think the DTS one stood out as the clear winner. Despite its low profile at the box office, Flight of the Phoenix comes with a nice set of extras. We begin with an audio commentary from director John Moore, producers John Davis and Wyck Godfrey, and production designer Patrick Lumb, all of whom sit together for their running, screen-specific discussion. At the start, the commentary seems a bit dry, but it picks up pace as it goes and turns into a very strong chat. Among the topics covered, we hear primarily about shooting in Namibia. The participants discuss all of the challenges that came with the location as well as the benefits. In addition, the commentary includes notes about casting and working with the actors, stunts and visual effects, editing and pacing, music and other auditory issues, and various story and character notes. The second half of the commentary tops the first, though the whole thing works well. Technical subjects dominate the early going; only as the movie progresses do the subjects loosen up and present a broader examination of the film. Ultimately, this ends up as a very entertaining and informative commentary. Next comes a 41-minute and 55-second documentary entitled The Phoenix Diaries. It presents footage straight from the set, which means any comments we hear are taken on the spot. These include notes from Godfrey, Moore, and actors Giovanni Ribisi, Miranda Otto, Dennis Quaid, Kevork Malikyan, Tyrese, Hugh Laurie, Scott Michael Campbell, Sticky Fingaz, Jacob Vargas and Tony Curran. It stays solely in Namibia, as we don’t any other parts of the shoot. ”Diaries” doesn’t appear to follow any particular schedule. Instead, it simply captures moments from the shoot and lets us get a glimpse of various parts of the production. Many of these focus on the emotional and volatile Moore; he gives us most of the entertaining bits when he goes off due to various problems. We also get amusing moments such as Ribisi’s discomfort with the promotional process and watch controversies about different issues. ”Diaries” definitely differs from the average DVD documentary in that it doesn’t resist bits that might make the participants look bad. Indeed, Moore occasionally comes across like a foul-mouthed ogre on the set, and some of the actors don’t come across particularly well either. That’s a refreshing twist that makes “Diaries” consistently entertaining and above average for its genre. By the way, many DVDs offer the disclaimer that the disc’s special features aren’t rated. Programs like “Diaries” are the reason for that, as it comes chock full of profanity. This sucker would easily earn an “R” rating if submitted to the MPAA; participants drop “F”-bombs with great frequency. Lastly we get a collection of Extended/Deleted Scenes. We find four of the former and two of the latter. Taken together, all six clips run a total of 14 minutes and 37 seconds. The pair of deleted scenes add little, as we just get some minor, redundant information. I like the extended bits better. They present some exposition and a bit more action. I don’t know if they should’ve stayed in the final flick, but they’re good to see. 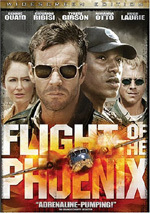 Flight of the Phoenix offers a spotty but generally entertaining action flick. Well, it succeeds when it concentrates on the action, as its character moments fail to add up to much of anything. Nonetheless, there’s enough here to make it moderately enjoyable. The DVD presents generally good picture with excellent audio. We also get a small but strong set of extras highlighted by a very informative audio commentary and a surprisingly candid documentary. Go into Phoenix without grand expectations and you’ll probably find enough to maintain your attention.